Be embraced in the aroma of this sweet, ripe mango handmade, artisan soap. Just like the real mango, this soap is golden yellow in color. Let this soap bring a touch of the tropics to anywhere you go. Be embraced in the aroma of this sweet, ripe mango handmade, artisan soap. 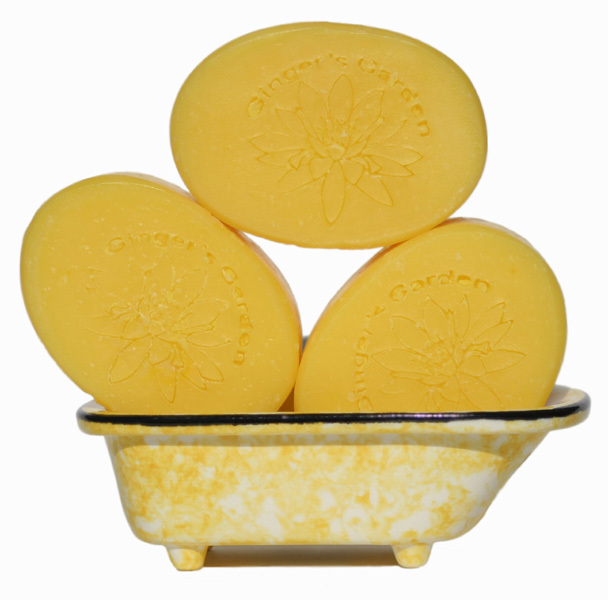 Just like the real mango, this oval soap is a golden yellow in color. Let this soap bring a touch of the tropics to anywhere you go. Mango Handmade Artisan Soap is made with a realistic and fresh mango fragrance, that’s juicy and delectable. This soap is a tropical infusion of mango juice that invigorates the senses. Indulge with this luxurious soap without the high price tag. Use Mango handcrafted soap in your bath or shower for a refreshing and cleansing experience. My handmade soaps are beneficial for any type of skin. Each soap arrives to you in a paper box that is suitable for gift giving. The box helps retain freshness and scent and protects the mango soap during shipping. The label has a complete ingredient list. I have been making soaps since 1969 and I still love what I do. I know you will enjoy the fruity scent of this bar. Some of my customers keep these in a pretty dish in the bathroom or use as guest soaps. Please use them, I have more! It is best to let Mango soap dry between uses. If you use a draining soap dish it will last longer. Handmade artisan soaps contain natural glycerin that can make the soap soft if it sits in water puddles. This soap is temporarily a regular rectangle bar, til I make more. Ingr: Olive oil, Coconut, Palm Kernel, Mango Butter, Castor oil, Soybean, Sodium Hydroxide, Beeswax, Fragrance, Sodium Lactate, Mica.